Compassionate, loyal, friendly and about the only thing on earth that loves you unconditionally. Dogs are said to be a man’s best friend for many reasons. 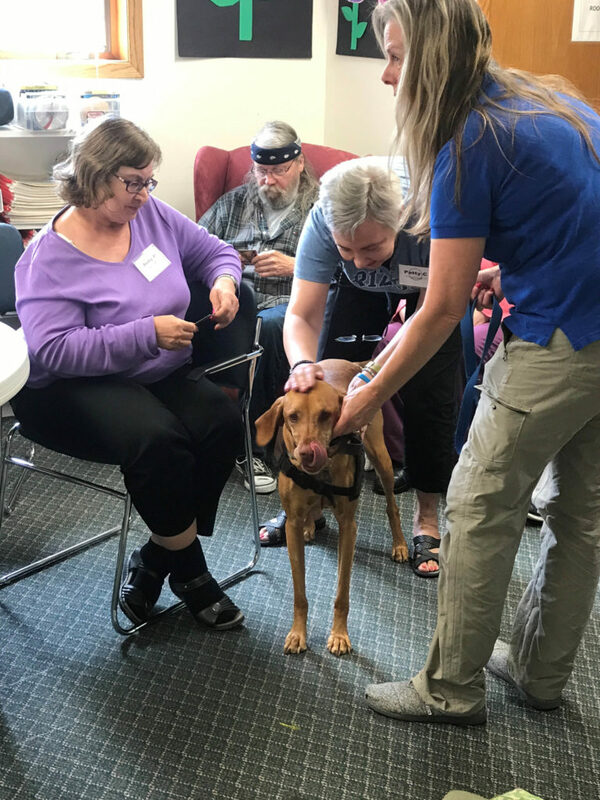 We recently celebrated “Dog Days of Summer – Music, Memories and Motion” with a couple of our favorite therapy dogs, Molly and Flynn, along with their handlers Connie and Patti. 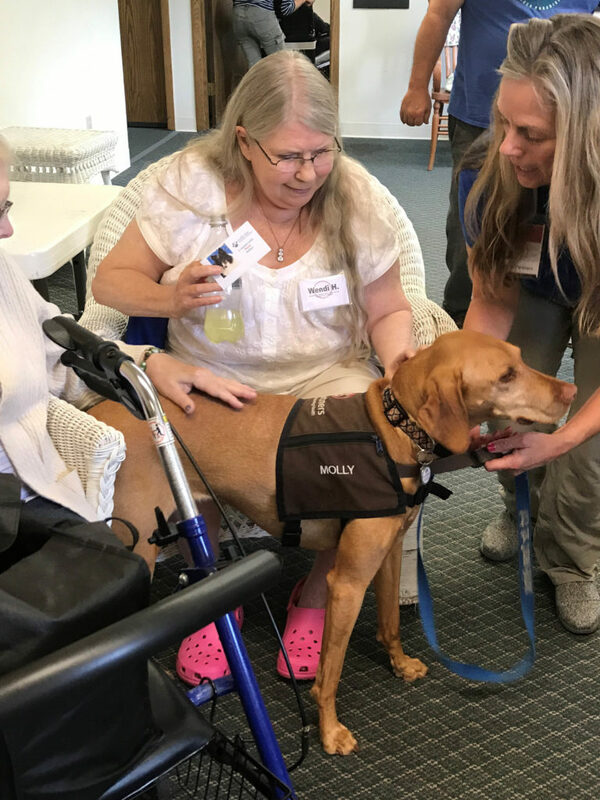 Both Molly and Flynn volunteer through North Star Therapy Animals where they visit facilities such as hospitals, nursing homes, schools, rehabilitation centers and other communities to bring comfort and joy to individuals. Molly and Flynn completed their training through Pet Partners, and are now registered therapy dogs for individuals in the community. Throughout training, dogs are tested to sit by their handler’s side, become familiar with walkers, canes, hospital gowns and other objects. The dogs must also demonstrate common obedience skills and respond to general commands such as sit, stay, come and lay down. Molly is also a registered R.E.A.D assistance dog, which helps improve children’s reading and communication skills by being an attentive listener, allowing a child to read at their own pace. improving cardiovascular health and decreasing a person’s heart rate, a decrease in recovery time for those needing physical therapy. There are also social and emotional benefits to the human-animal bond. Therapy dogs provide a happy and relaxing feeling to individuals. Sojourners are encouraged to keep their pets while living in the Sojourn Suites for these reasons. A special thank you to Connie and Patti for sharing Molly and Flynn with us! In honor of Molly and Flynn on National Dog Day, our Sojourn Songwriters wrote this song to the tune of “You Ain’t Nothing But A Hound Dog” by Elvis Presley. And you are good friends of mine!